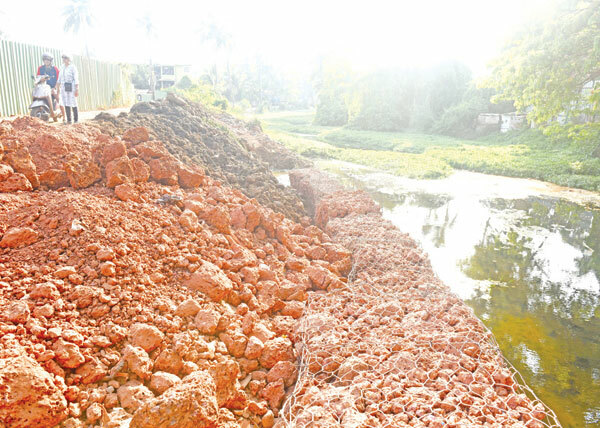 PANJIM: The creek in the capital Panjim, popularly known as St Inez Creek has been encroached upon near the sewage treatment plant (STP) at Tonca with an alleged illegal retaining wall under construction. A wall of boulders is being constructed by unknown persons along the creek behind the Government Quarters adjacent to the STP. When the Herald reporter visited the site, no board mentioning the work was seen and neither the machine operator carrying out the work was at the site. The visit further revealed that the excavator machine at the site is being used to excavate the existing silt along the banks of the creek and then replace it with the boulders which are first crushed into smaller pieces and placed in a wall shape with the help of steel nets. The under-construction retaining wall has encroached approximately around 7 metres of the creek. Locals allege that the work began few days ago. “I’m seeing this work being carried out only during the last week or so and was surprised as there is no official intimation anywhere. With almost 7 metres of encroachment, half the creek will disappear,” a local said. He further said that the retaining wall would result in flooding during the monsoons with water levels rising all across the creek. Another local alleged that the retaining wall is being built to facilitate the construction of a housing complex next to the creek. “Since the road between the housing project and he creek is very narrow, the retaining wall could be built to facilitate the builders here,” she alleged. When contacted, Corporation of the City of Panaji Mayor Uday Madkaikar informed that no permission for any retaining wall has been sought from the municipality. “As per my knowledge and information, no such permission has been granted. I’m surprised that such a large space along the creek is being encroached upon. This is totally illegal”, he stated. The Creek which has been infamous for the filth and garbage strewn into it has been an eyesore and one of the major issues plaguing the capital. The creek has led to flooding in various parts of Panjim as well as Taleigao, the source of the creek. Various plans to clean, renovate and refurbish the creek have been unsuccessful.